Don't wait to sell your home...the market is active! Dale and I worked an open house at our newly listed townhouse located at 1571 Cotton Drive just off Commercial Drive. As always we arrived early to set up for what we expected to be a well attended open house. This is what the entrance looked like at 1:30pm. 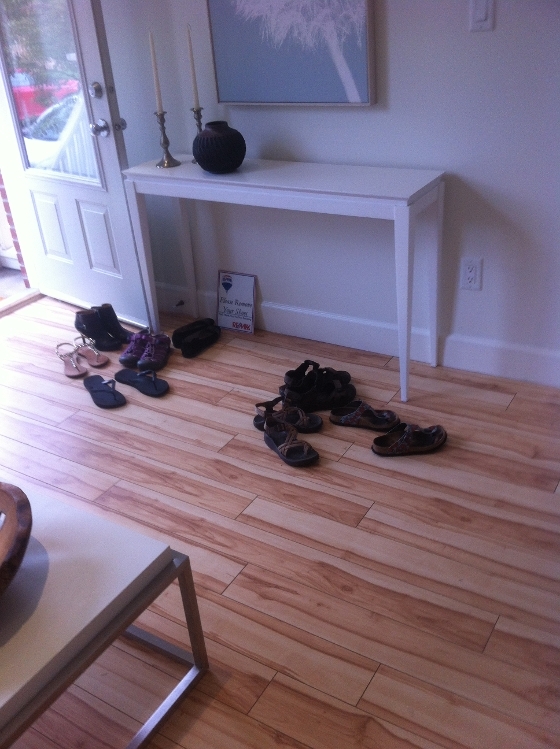 When there are eight pairs of shoes at the entrance 30 minutes before the open house is set to begin you know the market is active. All in all it was a very busy day with more than 50 groups of potential buyers through this property. The fall market is a great time to put your home on the market if you have been thinking of selling. How long will this active fall market last? It varies from year to year depending on market conditions, weather and various factors. Do not miss the boat...list now if you have been thinking of doing so. Contact us today to receive a copy of the most recent SnapStats that clearly show that most areas are "Seller's" or "Balanced" markets.